Do you want to know what my fat melting secret is that gives me energy naturally? And it’s not one of those potions, or pills, that you hear about with those crazy ingredients in it that you don’t even know what they are, and really, they cause all sorts of problems! My secret is so easy and inexpensive and you probably have these ingredients in your kitchen…right now! Now it’s not magic -remember you still need to be eating your healthy diet and exercising. This will give you an extra edge on your fat loss. I have been waking up at 4am to get my workout in before I go and train my clients at the gym and this little secret gives me energy and helps me to burn fat in order to reach a fitness goal that I’m working towards that I’ll have to tell you about later. This secret is helping me to lean out already! This amazing secret is going to help you melt fat, increase your energy, boost your immune system, so it has more benefits than just melting fat. Here it is: The three ingredients in this drink are lemon, cayenne pepper, and white tea. Lemon is awesome for cutting fat, phlegm & mucus in the body, it’s full of vitamin C, helps boost your immune system, fight infection, and reduce inflammation which will help you recover from your workout. Lemon also helps detoxify your liver aiding your body in flushing toxins and fat. 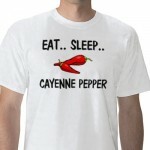 Cayenne pepper, some people know it as red pepper/capsicum, and it’s spicy! This herb is one of the most powerful herbs on the planet…… and is one of the ancient healing herbs going back hundreds of years. It has a high heat unit which helps increase circulation so you carry more oxygen and nutrients into your cells and body, and it helps increase your energy. Cayenne pepper also helps cut fat in the circulatory system and lower cholesterol. Ultimately it will help your body and brain have more energy in the morning! It’s an amazing fat burning tool! White Tea…this tea bag includes some other herbs including the shizandra berry. White tea is the least processed tea of the black tea, green tea, and white tea (they all come from the same plant) and has the highest antioxidants. It also gives you an energy boost without the crash later. It’s also a great boost for the immune system. Take the tea bag and put it in a water bottle (approx. 24 oz.) with room temperature water (you can cut the tag & string off of the bag) and then squeeze 1/2 a lemon into the water bottle, or whichever container you are using. Shake in a dash of cayenne pepper. At first just do a dash of the cayenne pepper to get your body used to it then once your taste buds and body get adjusted to it, you can add more. It is a detoxification so make it a gentle cleanse. You can work your way up to using a teaspoon of cayenne pepper. Fill your water bottle up with water! You can make this the night before and just stick it in the refrigerator. You may have noticed I didn’t boil water for the tea. Well, you don’t have to. It will infuse in the water just by letting it sit. Have this drink right away when you wake up in the morning. Then wait 30-45 minutes before eating anything. You want to give it time to detoxify your body. You are probably thinking, that’s it?????? Geez, where’s the magic ingredient from an exotic island? You see the gold is right under your nose! I never thought I’d be getting up at 4AM to go work out but this has really helped me get up and get through my cardio and thrive. My challenge to you is to drink this every morning for two weeks and let me know if it’s as life changing for you as it has been for me. It’s an amazing drink. I read your weight loss tips for vegetarian and heard the interview with Craig. Thank You for all the tips. They seem to have made my mind a bit lighter. I am an Indian in India, and vegetarian. Although we eat a lot of pulses, legumes and vegetables in each meal, we also have on an average 50gms to 100gms of tortillas(rotis) made out of dough of farm fresh wheat powder and water, in each meal, twice a day. I have been on Holly’s weight loss for almost 6 weeks now and although there is a gradual fall in my waist line, I do feel the bulge on the belly continues. There is a general guidance on the programme to cut on wheat due to gluten in it and dairy. I am fond of both. In a day, I take about 250ml of farm fresh cow’s milk and 150 ml of homemade cow’s milk yogurt. I was wondering if you think I should cut down or eliminate on both these. It would be difficult but I will for the sake of reducing my belly. I like your tip on the health drink above. Our dieticians in India suggest another similar herbal drink which is yum and also works wonders both on skin and weightloss. It is warm ginger lemon water with honey on empty stomach each day. That is half a lemon with a dash of fresh ginger (or powder) to a glass of warm water with one teaspoon of honey. It works wonders but I think you start gaining weight once you get off it. Ginger does the same to your system as the red pepper you mentioned. Good to have heard your interview, eventhough I stayed up till midnight to hear it. I really like certain aspects and spices in your culture. I crave curried foods sometimes, yum! Congrats on losing some inches already. you are doing great! About the wheat tortillas- The finely ground wheat powder converts into sugar quickly and your body can store it in your belly! Yikes! If you make them at home, you can add bran fiber to increase the fiber so your body digests it slower. In regards to dairy products, 250 mL equals 1-8 oz. cup. Doesn’t seem like your consuming much. I would recommend eliminating dairy for 1 month and see how your body responds. Remember dairy contains sugar. 1 cup of milk contains about 12 grams of sugar so the dairy can be adding unnecessary calories to your diet. It can be very congesting to the body and make you feel sluggish. But without seeing your entire diet I can only address these to foods. You could be eating healthy foods, just too many calories. If getting enough calcium is a concern, increase your consumption of greens in your diet. Thanks for the info on your version of a healing drink! Sounds tasty! Just be careful with the lemon juice. i was drinking it in warm water first thing in the morning, for several months, and the Naturopath told me to brush my teeth straight away to get rid of the acid from my teeth. I started getting pain in my teeth so i visited my dentist and was shocked to find that i had brushed away alot of the enamel from my teeth. in some spots i had indents in my teeth!! Very good point. I appreciate you sharing. I will make this suggestion- rinse your teeth with fresh water after drinking the mixture. This way there is no harsh contact with a tooth brush. Yes you can use Green tea, it is still a great tea option. Just not as much antioxidants as white tea. Many thanks for the detoxifying drink. You said that you get up at 4am to get your workout in. What time do you go to bed? Funny you should ask me what time I go to bed. I go to bed later than I “should”. And my husband reminds of this everyday. I am answering comments right now at 10:30 pm and I will be getting up at 4am. So doing the math… way too late! I’m working on going to bed earlier! Wish me luck. please can you tell me where you can buy white tea bags in italy? Does it have a different name that I can look for or would green tea be a fair substitute? I do not know what another name would be for white tea. It comes from the same tea plant so maybe explain it’s the new baby leaves/shoots off the tea plant when it’s harvested in the spring. Black, green and white tea all come from the same plant. Green tea would be your next best sub. So when you say detoxify your body – you mean get rid of stuff? Reason why I asked if I go running in the mornings – should I be doing this prior to my run? It is not a long run or anything like that – probably an hour! Don’t worry about any “surprises” on your run. haha… More internal “scrubbing” going on for liver, blood, circulatory system, etc. If you can stand it chew on a thumb joint piece of raw Ginger root and drink the mixture through it, them swallow it.. I tried doing it for a couple of days and I ended up with a Migraine for a week – apparently citrus triggers migraines – not fun. If you have a sensitivity to citrus then looks like this one’s not a good fit for you. However, if you cut out coffee or caffeine at the same time, then the head ache could be coming from this. Just something to consider. Regarding suffering from a migraine after drinking lemon, lemon is a safe easy way to detox and often people suffer from headaches when they detox. However, if a person knows that he/she is sensitive/allergic, they should avoid taking that particular food item. What a great suggestion. Since I have a lot of hot chillies growing in my garden, I substituted cayenne pepper with it. Just pour boiling water on the chilly & lemon, but I dont know where to get the white tea in Australia. Can you tell me where or send a pic of what it looks like, what brand? I am unfamiliar with Tea in Italy. I’m pretty sure they have it, just not sure where. Maybe a health food store or maybe a coffee shop just like in the U.S., Starbucks carries white tea. It’s probably pronounced Bianco Te in Italian or something like that. You’ll find it I’m sure. Also, I’ve had this the past 2 mornings and have FELT GREAT! However, I still get a case of tireds mid-day. Would this be a good drink to consume twice in one day? Or, too much? Yes you can use lime instead. You could have this twice in one day. Also, make sure you are drinking plenty of water throughout the day also. This can help you wake up. Being a little tired mid-day seems to be universal. I hear this all the time from my clients. Maybe a 10 minute refresh break/ stretch break/breath fresh air or catnap would be helpful. That’s what other cultures of the world do. In regards to staying up late, make sure you’re not drinking coffee or caffeinated drinks too late in the evening. I also find that regular exercise helps regulate my sleeping patterns. I have the same question as Sue should this be done before or after a morning run? You can drink about a mug full before you run. The drink won’t slosh around in your stomach in that amount. If you drink more it might. Then drink the rest when you finish your run. In terms of any “emergencies”, don’t worry, it’s a mild cleanse that will not create a strong reaction. you will be ok.
Hi Kardena – I’m going to start doing this drink tomorrow! Do you drink the whole 24 oz all in one go? Yes best on empty stomach before eating breakfast. I am always just so amazed how much I have learned from you. Thank you again for another incredible tip! You Rock! I’ve been making your lemon juice/cayenne pepper/white tea drink now for a couple of weeks – and I love it! I couldn’t find white tea in teabag form, but my local grocery store does carry Lipton White Tea To Go, 10 packets which you pour into the water, so that’s what I’m using. I also sometimes just use a green tea teabag instead. Anyway, I drink around 24 oz. of it each day. What I’ve found is that I’ve cut down quite a bit on some of the other liquids that I’d been drinking (like soy milk, v8 juice, Old Orchard Grape juice). And also, I seem to be drinking more plain water as well. Also, I seem to be eating less as well. Thanks for this recipe! Glad you found the white tea. I try and find organic or the next best thing. Wow, you have probably taken hundreds of excess, frivolous calories out of your diet by cutting out those unnecessary drinks! Great job! Weight loss will follow! Just a suggestion for people who have tooth enamel issues – drink the lemon drink through a straw! Mine is a question,normally when i wake up i hit the gym for only one hour then i spent the rest of my day idle but i try to eat right,is that enough for me to loose weight? Me being a trainer and all. Depends on what your definition is for losing weight and how much you want to lose and how lean you want to be. In my world there is the triangle for success. A healthy diet, cardio, and weight training. these three elements will make you successful in losing weight. So depends on what your diet is and what you are doing at the gym. weights help keep your muscle tone. Your muscle is what increases our metabolism, so work them! And don’t be shy, challenge yourself/ push yourself. Are you using the EZ Veggie meal plan? If not, then I don’t know how healthy your diet is. Give it a try! Have started using your recipe above. A couple of questions. Is it only to be drunk once a day in the morning? Do you have to eat around 45 minutes after drinking it, for best results, or can it be a couple of hours after? Can it be drunk during the day? PS: You look truly amazing! wow Jim, What a powerful testimonial to what this drink can do! thank you for sharing the message of health and vitality with the ones you love! I’ll keep bringing great info to you. Keep being a beacon of light and hope. When drinking anything, use a straw (except hot beverages, of course). I try to follow up any drink with 4oz-6oz water.